z = pskdemod(y,M) demodulates the complex envelope, y, of a PSK-modulated signal having modulation order M.
z = pskdemod(y,M,ini_phase) specifies the initial phase of the PSK-modulated signal. z = pskdemod(y,M,ini_phase,symorder) specifies the symbol order of the PSK-modulated signal. 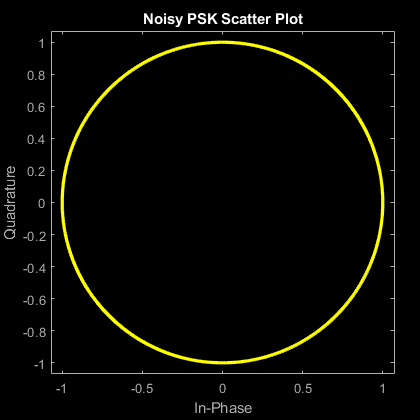 Compare PSK and PAM modulation schemes to demonstrate that PSK is more sensitive to phase noise. This is the expected result because the PSK constellation is circular while the PAM constellation is linear. Specify the number of symbols and the modulation order parameters. Generate random data symbols. Modulate msg using both PSK and PAM to compare the two methods. 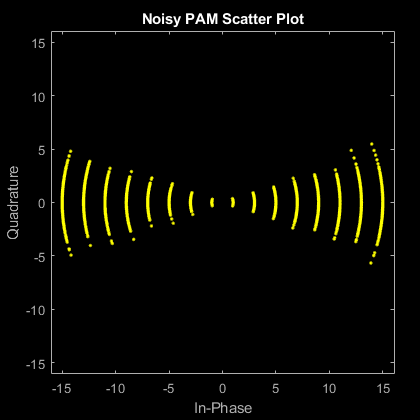 Perturb the phase of the modulated signals by applying a random phase rotation. Create scatter plots of the received signals. Compute the number of symbol errors for each modulation scheme. The PSK signal experiences a much greater number of symbol errors. PSK-modulated input signal, specified as a real or complex vector or matrix. If y is a matrix, the function processes the columns independently. If ini_phase is empty, then pskdemod uses an initial phase of 0. PSK-demodulated output signal, returned as a vector or matrix having the same number of columns as input signal y.